Article by Danielle Fitzpatrick Clark, published on Glancer Mag. You won’t find a 28-year-old who’s more fun to hang out with than Christina Schutz! 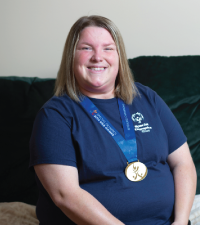 Not only does she love to shop and go bowling, but Schutz is a standout athlete, playing volleyball for the Illinois team in the Special Olympics this year. Schutz has lived in Darien for the past 23 years and is a 2007 graduate of Downers Grove South High School. Her parents, Carol and Mike, and brother, Brian, have been cheering her on for years as she’s participated in volleyball. Christina has been playing volleyball with Seaspar, a special recreation association by the Illinois Association of Park Districts, in Downers Grove for the past 11 years.